roasted concord grape two ways. Once your fruit is roasted, Place a generous portion of it on top of your bowl of Greek yogurt and drizzle with a little maple, a tiny hit of sea salt and a good heaping tablespoon or two of flax seeds! 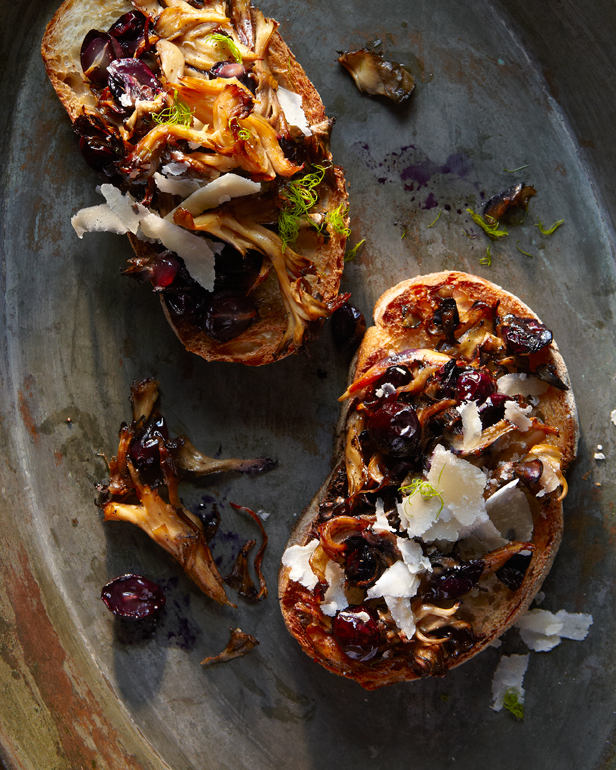 My other grape inspired recipe is Concord grape and Hen Of The Woods Crostini. Place a generous amount of hen of the woods mushrooms on a lined baking sheet or in a big cast iron frying pan. Drizzle with olive oil, seas salt and fresh cracked black pepper. Cut a handful of concord grapes in half and gently remove the seeds. toss the Concord grapes with the hen of the woods and olive oil mixture. Throw the pan in the oven and roast at 350 degrees until the mushrooms are soft and some of the edges are a touch crispy. Toast some really good bread and brush with olive oil after toasting. Top the bread with the roasted mushrooms and grape mixture. Shave some Pecorino Romano on top and get to eating! I promise to be back sooner than later!